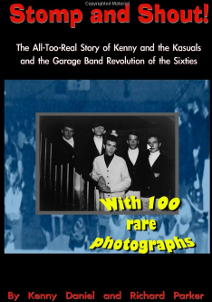 Stomp and Shout is the all-too-real story of Kenny and the Kasuals and the garage band revolution of the sixties. An uninhibited look at the wild days and wilder nights of Texas’ rock’n'roll “garage kings” from two guys who were there when it happened. From High School gyms through “Journey To Tyme” (the first psychedelic rock record) and all the way through progressive country music to wild-eyed punk, it’s a musical journey with roller coaster twists and turns. Also, Stomp and Shout serves as an invaluable history and deep-digging chronicle of the North Texas music scene of the time period. This includes a complete discography of virtually every rock and pop recording artist of the area and the era. Plus history, commentary and a discography of The Garage Bands. This book is a non-stop, fun, nostalgic trip back to the Dallas area in the days of the baby boomers’ youth. Over 200 photos and visuals enliven the story which is told in a truly lighthearted and enjoyable “easy-read” way. Anyone who grew up in the era and the area will find hundreds of things they remember fondly – from the local TV shows, favorite hangouts, movie theaters, dances, shopping, burger joints, roller rinks, gymnasium sock hops, schools, the Fair, music, bands, sports, concerts, local radio and TV personalities to first-hand accounts of events like The 1964 Beatles concert and sneaking into drive in theaters. This 224 page book has been described as “A must read for baby-boomers who grew up the Dallas – Fort Worth area… “ (Shari Goldstein Stern – The White Rock Lake Weekly). “Return with us now to those thrilling days of yesteryear….” Take a fun rollercoaster ride through Dallas back in the day! Do you remember: The Studio Club, Icky Twerp, Mickey and Amanda, Sivil’s, Kip’s, KLIF vs KBOX, The Buckner Drive In, Charlie and Harrigan, Surfers A-Go-Go, The Lakewood Rats, The Lady of the Lake, The Ride-N-Laff, Six Flags, Charco’s, The Prince of Hamburgers, Storybook Land, Kat’s Karavan, The Big D Jamboree, or The Wilshire Theater? 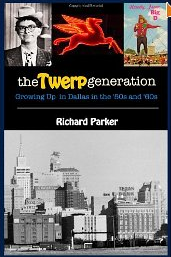 If not now, you will when you read “The Twerp Generation Growing Up In Dallas In The ’50s and’60s”. An adventure in time – A funny, exciting and romantic trip through the past. 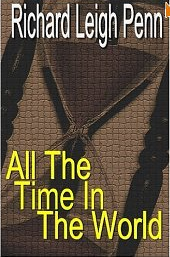 “All The Time In The World” chronicles the wild times and wilder problems created when an average guy is given the ability to travel through time. Visit www.RichardLeighPenn.com for more information!